In SEPTEMBER: Stepping Outside the Studio - Alexander Technique Workshops with Julie and Guest Teacher, Shawn Copeland. September 28 - October 1, 2017. In OCTOBER: Practice of Making - Dance Making, Improvisation, Performance, Collaboration, Possibilities. A three day workshop with Zap McConnell and Julie Rothschild. I just have to report that I had one of the most inspiring and fun teaching experiences of my career a few weeks ago in Crete, Nebraska. The Barstow Summer Alexander Technique Workshop was simply wonderful. My colleagues and the students created an incredibly supportive environment for all to make new discoveries. I made many of my own! This is exactly what I aim to bring to FloorSpace Studio. Alexander Technique and Movement opportunities for anyone who is game to bring their curiosity to the floor. Let's move! Photo is not from the workshop but it represents the spirit of fun that was had. New Classes and Workshops coming soon! DUST. Footstool made by Zap's grandpa. Cloth/words by Judith Leemann. Music by Heather McIntosh. Photo by Cinthia Pérez Navarro. Performance Space: Wherehouse Art Hotel. I got home late last night/early this morning. After a few hours of deep sleep, I did some aimless wandering around our home. Our sons are away. When they were younger and I’d come home from trips, we would gather and snuggle and tell each other stories about what we’d been up to. I felt a little guilty for not being around for those few days of their lives - but also deeply satisfied at diving into work in new places, in new communities. This morning was quiet and sweet. Our dog, waiting and watchful - where have you been? where are the others? will you please just lie down here with me and rub my belly? And then there is a garden fresh rhubarb crisp in the fridge, made by Paul. Today is the day for caffeine/sugar highs and lows - I surrender. I just returned from Winston-Salem where I shared this solo as well as new work by Chicken Bank Collective during the On Site/In Sight Dance Festival - presented by Helen Simoneau Danse. Every event - classes, pop-ups, performances - was free. Even the screening of Secondary Succession at aperture cinema was free. Support from the city and local businesses made it so. I now have a serious art crush on Winston-Salem! Cinthia, Zap and I, 3 of the 6 chickens, had a conversation early in the week about how we can support each other going into performance. We offer help with logistics, we offer feedback, and most importantly, we show up for each other in the midst of performance. We collaborate by witnessing. All of the organizers, participants, space providers, photographers, videographers and tech crew in this festival were also unspoken collaborators. By being present with their own questions and curiosities, they affirmed my own and pushed me to dig a little deeper. The girl who danced near me in the art park and then skipped away - she is forever a part of this dance. The kids who I overheard saying, “she just keeps going in circles.” Yes - I do - thank you for noticing and staying with me as I did so. DUST is emerging out of a solo I made a few years ago. In the last year, it continued to grow out of time spent in Munich - where I realized a rich and tragic family history, and found myself surrounded by ghosts. DUST is a work I believe I will explore/share/perform until my dying days. I see how it/I/we are simultaneously becoming and dissolving. If I stop asking questions in the midst of it - well - then I will put it away in my trunk of treasures. On Site/In Sight gave it a place to land for a moment, provided a fresh context, and gathered a new community of collaborators. I extend a big hug of gratitude to those who gave us beds to sleep on and food to fuel us forward! liz simmons, mary's gourmet diner and small cafe. to our surprise visitors, John and John! to Katharine - long live our duets! to Denisse, Gaby and Paola - always together no matter where in the world we are. to Arcadio, Ximena and Amber. to Celeste MIller and the MAPSanew folks - thank you for dancing here/not here with me. to Helen, Caitlyn, Jessie, Blakeney, Julianne, Adam, Haydee, Christina, Chris, Taryn, Bea, Cara, Kyoko, Jimbo, Derek, David, Paideia - wow - I can't wait to dance with you again! And here in Boulder, if you are interested in training to become an AT Teacher, if you want to go more in depth with Alexander Technique to assist you in your life and work, if you are already an AT Teacher and want to gather for continuing education - let me know! 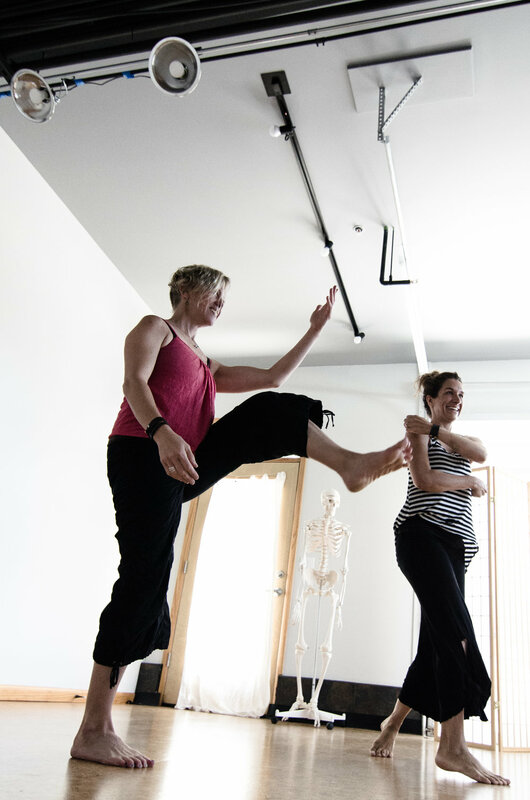 Beginning this summer and fall, I will be offering ongoing group movement/practice/study sessions at FloorSpaceStudio. Stay tuned. Tomorrow I fly out to San Francisco to take part in a Somatic Education course offered by Moving On Center. For 5 days, I will be immersed in Bartenieff Fundamentals and Alexander Technique. This sort of immersion is like being a kid in a candy store (for movement geeks like me)! The moment for me to hit the refresh button and begin this learning again is definitely now. AND, the study continues with gatherings in July and November. I’m diving in. As of late, I’ve had the great opportunity to move and study with ClydeRae Jolie-Ashe. Whether we’re practicing yoga or talking about the weather, I find myself gleaning from her wisdom. And of course, to synthesize the learning and the teaching, there must be making and performing. May 3-6, 2017 in Winston-Salem, I will join Zap McConnell and Cinthia Pérez Navarro as a triad representation of Chicken Bank Collective for the On Site/In Sight Dance Festival. The festival opens with a screening of the film “Secondary Succession,” directed by Zap during our residency in Washington in 2015. The three of us will each perform solo work as well as a new trio. So excited to be a part of this! FloorSpaceStudio continues to thrive! Teachers and Dancers making great use of this tiny space: Wendy Hepworth, Mandy Greenlee, Molly Kittle, Laura Ann Samuelson, Joanna Rotkin, Nancy Rao, Cynthia Ghiron, Andrew Marcus and Didem Ergin. It’s a beautiful thing and I encourage you to see what they're up to.